This chair offers a unique seating concept designed to help eliminate back, hip and tailbone discomfort that often occurs from sitting for extended periods of time. With its unique design, the Comfort Rx is able to conform to individual users needs, providing bones and muscle support throughout the day. 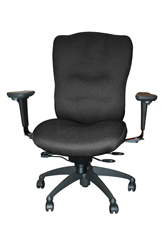 Features include: laminated back foam densities, adjustable back height/angle, memory foam seat & back overlay, mechanical adjustable lumbar support, soft urethane arm pad for ergonomic comfort, vertical/horizontal/forward/rearward arm adjustment, scalloped seat center, a horseshoe seat gel that cradles and comforts the upper thigh, a waterfall seat front to relieve back stress and an integral seat depth slider. Seat Ht Range: 17 3/4" x 20 3/4"